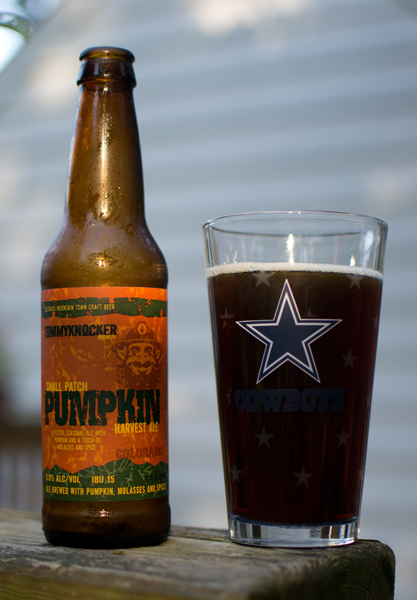 And the search goes on for a better Pumpkin Ale than the version brewed by Dogfish Head. I don’t think I will find one but here is to trying. Beer #309 is St-Ambroise Pumpkin by McAuslan Brewing from the little town of Montreal in the provice of Quebec, Canada. This is a Pumpkin Ale with an ABV of 5%. It poured a nice clear amber with a tiny white head. The nose was very much like pumpkin pie spices…nutmeg, cinnamon, & cloves. Those smells came through in the taste big time. This was quite the spiced up brew, mix that with some slight pumpkin taste and there you have it. It had a slight, and I mean slight, caramel malt base also. It got quite bitter near the back end and the nutmeg flavor went on into the aftertaste. It had a medium-light body and the mouthfeel was quite harsh as I thought it was over-carbonated. This had what I was looking for, a pumpkin pie like flavor. The problem was it wasn’t subtle. Plus I really didn’t like the harshness or the bitterness here. Strange…as I do enjoy a bitter beer but it just didn’t work all that well in this. 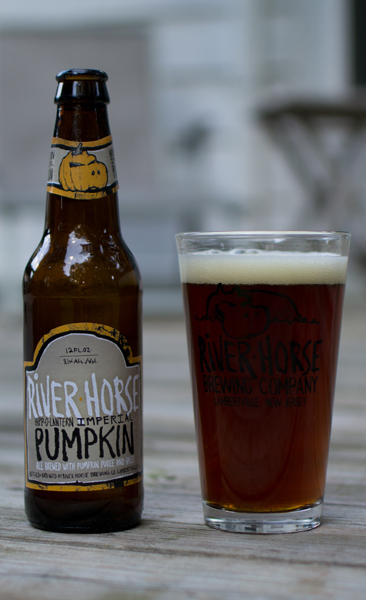 How about another Pumpkin Ale for beer #286? Well…want one or not, that is what I have on tap for today. 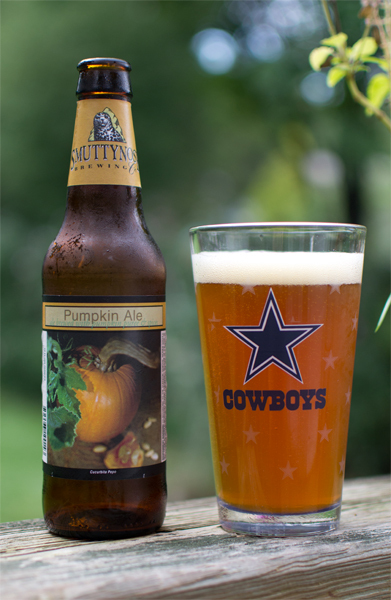 Pumpkin Ale from Smuttynose Brewing Company is brewed in Portsmouth, New Hampshire. Their version of a Pumpkin Ale has an ABV of 6%. Well, it started off good…it had a nice amber color with a touch of orange. The white head was OK and it left some excellent lacing. The nose smelled like vegetables. I didn’t detect any pumpkin in the nose, although since I did get a very generic vegetable smell, maybe that was the pumpkin? But I thought pumpkin was a fruit? Ahh…what do I know, either way it didn’t smell like pumpkin at all. There was a faint, and I mean faint aroma of nutmeg here also. The taste opened with the nutmeg like spices and then was dominated by caramel malts. There was a quite pine like flavor and bitterness near the end of the sip that lasted well into the aftertaste. It had a medium body and was low in carbonation. As a Pumpkin Ale, it was not all that great. If I’m going to drink a Pumpkin Ale, I want it to taste pumpkin. My wife took a sip and she had no idea it was a Pumpkin Ale until I told her so…even then I don’t think she believed me. That being said, it wasn’t a horrible beer. I liked the spices and the bitterness and flavor of the hops but it will get no higher than a Jester Juice rating from me. Another day, another Pumpkin Ale. Beer #285 is Small Patch Pumkin Harvest Ale by Tommyknocker Brewery from Idaho Springs, Colorado. Their version of a Pumpkin Ale has an ABV of 5% and the IBUs are even on the label coming in at 15, which means a beer low in bitterness. You have probably noticed multiple uses of my Cowboys pint glass, and today was no exception. Into said glass went this dark brown brew with no head. The nose was more molasses than pumpkin but you still could pick out the pumpkin, even know it was a bit faint. There was a bit of nutmeg also in the aroma. This was one of the better Pumpkin Ales nose wise I have had. It was quite malty tasting with roasted caramel and a bit of sweetness from the molasses making up a big part of the flavor. This had more of a raw pumpkin flavor mid drink with a nice earthy thing going on. It finished with a slight nutmeg flavor and it left an odd aftertaste. Not horrible…just odd. The carbonation was quite low, the body was medium and it was a tad bit creamy. This was a decent Pumpkin Ale. I would have liked it a bit more sweeter but overall…not too shabby. One thing I did like about this was that it reminded me of fall…which seems like it is coming on ever so quickly. More and more Pumpkin Ales are hitting the shelf so I figured why not have one for beer #284? After all, I do love most everything pumpkin! 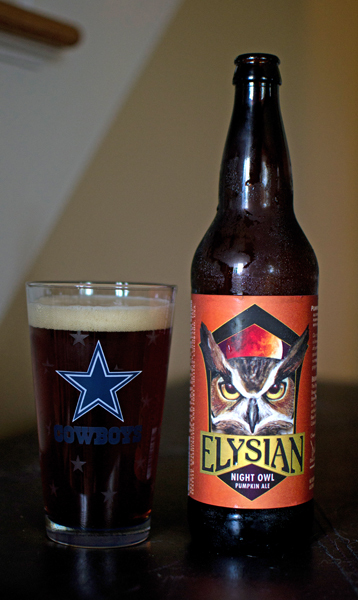 Night Owl Pumpkin Ale by Elysian Brewing Company from the either Colorado or Washington (that what is says on the bottle) is a Pumpkin Ale with an ABV of 5.9%. According to the label, each barrel of Night Owl is brewed with over 7 pounds of pumpkin. Lets give it a taste…shall we? Night Owl poured a nice orange amber with a one finger width off-white head. The nose was faint with a canned pumpkin pie mix aroma. There was just the tiniest of nutmeg and clove also coming through on the nose. The taste let me down, I got very little pumpkin in the taste but there was quite a bit of caramel and spice here. It was mostly nutmeg for the spices I was tasting. The body was a bit on the light side with some nice carbonation gently prickling the tongue. This was OK but nothing special. With some Pumpkin Ales you would be hard pressed to know they were brewed with actual pumpkin. At least it had a slight pumpkin flavor here. 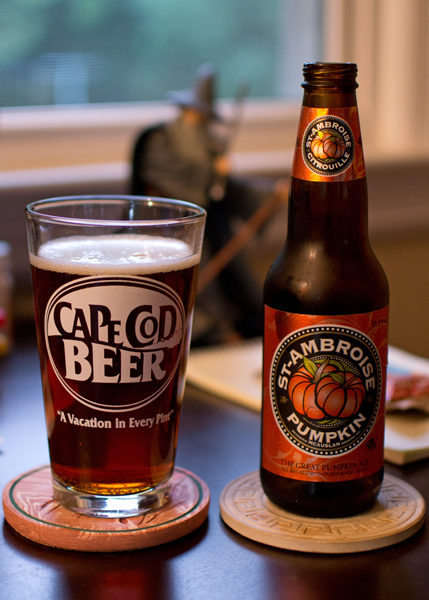 I have a few more pumpkin ales I will be trying over the next week or so, so lets see how they compare. So far, I don’t think any will knock off my all-time favorite Pumpkin Ale from Dogfish Head. We shall see though. Earthquake day here on the east coast. A 5.9 quake centered in Virginia was felt as far away as New Hampshire from reports. I was at work (on my lunch break tinkering with my new bike) at the time and I didn’t feel a thing. My co-workers said it lasted for about 30 seconds and the building was doing some odd things. Again…I felt nothing. Deep down inside, I wanted to feel it…but no such luck. Oh well…maybe next time but to be quite honest, I’m not sure I want a next time. At least I got out of work early. Into my River Horse pint glass I poured. I was greeted by a nice dark amber brew with one finger width cream colored head. The nose was kind of lame. I love just about everything pumpkin and all I really got from the nose was brown sugar. Where is the pumpkin and nutmeg (or any spice for that matter)…I guess I was hoping this would smell like liquid pumpkin pie. A deeper whiff also revealed an alcohol presence. I took a sip and the taste that stuck out most was caramel. The alcohol also made an appearance. It wasn’t a horrible tasting beer by any stretch but I think if you gave it to me without me knowing it was a Pumpkin Ale, I would be hard pressed to identify it as such. The body was nice, it had a medium feel with the carbonation on the low side making this quite creamy. I was disappointed, I wanted pumpkin but didn’t get it and for that alone, I say give it to the peasants! If you know me, you know my absolute favorite holiday dinner is Thanksgiving. The turkey, the side dishes, the pies. And what is my favorite pie of all time (well my second favorite… ) ? Why pumpkin pie you silly things. 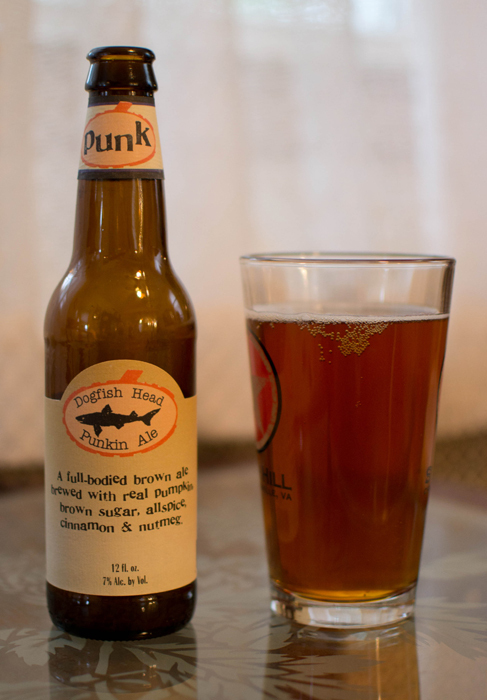 Beer #69 is Punkin Ale by Dogfish Head. This is a Pumpkin Ale with an ABV of 7%. Into the pint glass it went and I was rewarded with a beautiful amber or honey colored beer with no head whatsoever. The nose was nutmeg, cinnamon, sweet bready malts…think pumpkin pie and you have what this smelled like. Taste was exactly like it smelled. All the great qualities of pumpkin pie came out in the taste but in no way was it overpowering. I still knew I was drinking a beer as opposed to taking that pumpkin pie and liquefying it. The mouthfeel was on the slightly thick almost sticky side. The carbonation was really nice, not too fizzy or too light. It was high on the drinkability chart for me, but I am a fan of pumpkin pie so your mileage may vary if you don’t like pumpkin. It was gone much too quick despite trying to savor it. I’m looking forward to next fall to get more of this, hopefully by the case. Easily the best Pumpkin Ale I have had. I love this beer. It reminds me of fall, one of my favorite times of the year. Punk for the win! This was a freebie…cheers to the woman who gave this to me…you know who you are.